The 19th-century summer, bringing with it those twin temptations, iced water and unripe fruit, was traditionally the season of cholera. I’ve written about the ravages of the disease in Paris, as well as the macabre jokes used to cope with the terrors of the Black Plague, as it was sometimes called, because victims’ faces quickly darkened with dehydration. In my post on cholera jokes, I noted that there were curious Fortean phenomena associated with the pandemics, and promised a future post. Today that plague has come upon you. Having been fortunate enough to not have experienced a cholera epidemic, I do not know if these stories of unusual animal behavior, superstitious beliefs, and plague omens are simply the result of fear or whether they represent genuinely anomalous phenomena. The disease was not well-understood; some thought “miasmas” and bad odors were the cause, positing clouds of poison drifting across the land. But which came first, mysterious mists or miasmal theory? Omens of Cholera in Cleveland. To be fair, the Cleveland newspapers were overflowing with tallies of European cholera fatalities, as well as advertisements for guaranteed preventatives/cures for the disease. The Fifth Pandemic began in 1881 and it was pretty much a given that cholera would hit at some time during any given summer in the 1880s and 1890s. In addition, although the local Health Officer issued a proclamation in May 1886 that all citizens must clean up their trash, the Cleveland municipal authorities did not allocate funds for refuse collection and left it to each householder to pay for garbage disposal. This did not go over well. Perhaps the blue-fog Munchausen wished to call attention to this hazard. White and yellow mists were also seen just before cholera hit. Mysterious lights as well as magnetic and electrical anomalies also accompanied the cholera. This particular author, with his vivid descriptions of lurid clouds of pestilence and physics-defying magnets had a theory [read: bee in his bonnet] that “ozone” was the preventative and cure for cholera. A Mysterious Light in the Pike County Hills That is Considered as a Warning. Port Jervis Dispatch to the New York Sun. A curious phenomenon was witnessed by the residents of Mongaup, Sullivan county, a small village in the Delaware valley, five miles west of this place on the night of the recent great snow storm. On the Pennsylvania side of the river, the Pike county hills rise steep and rocky to several hundred feet high. While the storm was at its height a bright light suddenly flashed up among the high rocks opposite Mongaup, near the summit of the range. There was no blaze, but the snow-covered rocks glowed like red hot iron for distance of several feet around. The light resembled a huge bed of live coals, and cast a weird reflection non the snow, throwing the trunks and lower branches of the bare trees into strong relief. The light gleamed through the storm for several minutes, and then gradually grew dim and disappeared. With a disease so poorly understood, even by doctors, omens, portents—and mystic cures filled the void. Borax, bitters, and bile salts were all well-advertised anti-cholera specifics. “The very best French brandy” was also recommended. Folk medicine contributed a few less-well known and perhaps less palatable remedies. It is estimated that 57,000 deaths from cholera occurred in Russia during 1910. The coalmine owners have subscribed £60,000 to the anti-cholera campaign. Cholera can be avoided by wearing over the pit of the stomach a small bag filled with black pepper, cloves, allspice, camphor. It must be prepared in full moon. 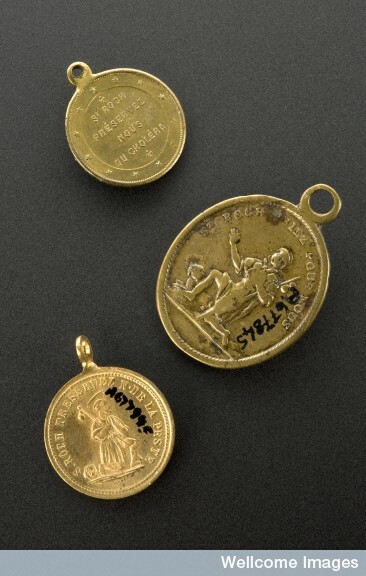 Top to bottom: A678713, Brass medallion involving the protection of St. Roch against cholera, France, 1820-1880. A677845, Gilt medal of St. Hubert and St. Roch, loop for suspension as holy pendant, possibly French, 1830-1900. A677945, Gilt medal of St. Hubert and St. Roch, loop for suspension as holy pendant, possibly French, 1830-1900. Grey background. One of the least repugnant cures involved—living sheep. Singular Superstition Respecting the Absorption of Disease. Turin, Aug. 28. The Italian peasants in the cholera district repel the doctors, and prefer to trust in charms and superstitious observances. At Buses a girl was found dying in a filthy room in which two sheep were feeding from a nasty trough. 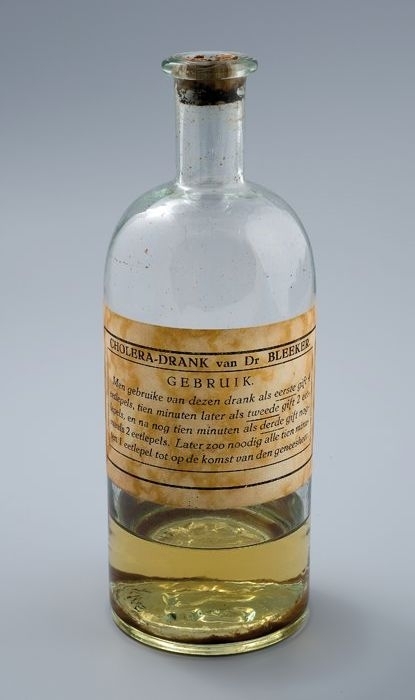 ABSINTHE AS A CURE FOR CHOLERA. Epidemics inevitably bred conspiracy theories about poison. The Cholera Superstitions in Italy. Press telegraph—Copyright ROME, September 1. The authorities have hitherto suppressed the facts of cholera ravages and of the riot at Verbicaro…. In one particularly egregious example of a legend generated by the disease, in 1832, as the cholera reached Ireland, it was reported that New Ross, County Wexford, which had suffered large numbers of deaths, had been incinerated by a falling star. Smells and miasmas were believed to cause the disease. It is difficult to judge whether the following events from 1849 Indiana really were truly strange or merely seemed so in dire circumstances. Anything out of the ordinary was often given a supernatural spin. 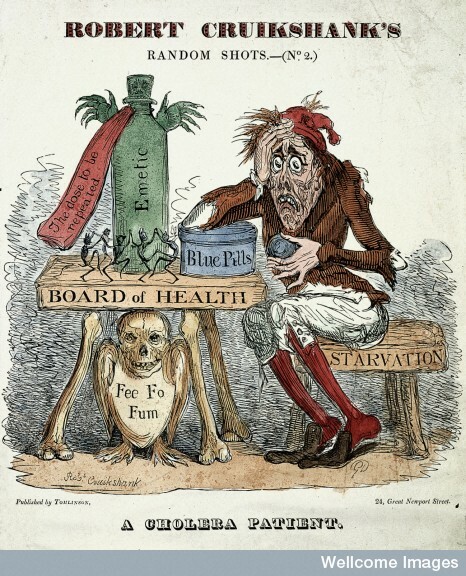 Observers of the cholera always seem to mention the peculiar behavior of animals and birds. Today, of course, we would assume that mammalian or avian forms of the cholera (chicken and hog choleras were well known) were responsible. Often mentioned in the same breath were the unusual darkening or damage to metals exposed to the elements. The author before us thinks that substances painted with white lead, and exposed to the air, suddenly assuming a dark color (the ozonometer will indicate impurity); and winds from unusual quarters, and unusual and long protracted calms, indicate the approach of a pestilential disease. The south winds have blown upon the city of Philadelphia ever since 1793, more constantly than in former years. Malignant and mortal epidemics are often preceded by uncommon sickness and mortality among certain birds and beasts. They have both appeared, chiefly among wild pigeons and cats, in the United States. The mortality among cats, previous to the appearance of epidemics, has been taken notice of in other countries. [735 cats died in the Indian town of Ahmednagar in less than a month in July 1881.] Dr. Willan says it occurred in the city of London, between the 20th of March and the 20th of April, in the year 1797, before a sickly season, and Dr. Beniecia says it preceded a mortal epidemic in Paris. While I understand why mosquitoes might multiply without birds, I’m mystified by the repeated instances of disappearing house-flies. This next account also contains another motif frequently mentioned in accounts of the cholera, that fish and meat rotted exceptionally quickly. A minor Fortean theme of the Victorian/Edwardian period was the appearance of those mysterious entities known as The Woman in Black. Veiled and dressed in black, they flitted about in the dark and were thought to be harbingers of disease. Even royalty was not safe. In 1850 a still more extraordinary thing occurred a few days before the death of Queen Theresa of Bavaria. King Louis and Queen Theresa were passing the Summer in the Castle of Aschaffenburg, where their son-in-law, the Grand Duke Louis III of Hesse-Darmstadt, came to see them. In the evening when all of the court were at tea several persons present saw a woman in deep mourning silently glide through the room. She stopped a moment behind the chair of the Queen and fixed her eyes upon Her Majesty. Then she disappeared through the door of the antechamber. 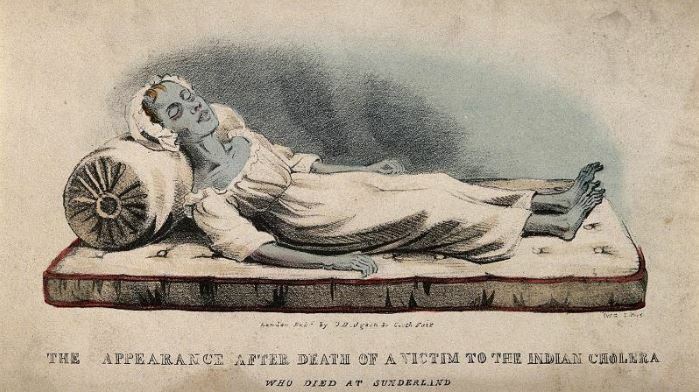 If I wanted to be even more Relentlessly Informative, I could mention the nasty habit cholera corpses had of sitting up, moving their limbs, or opening their eyes after the rigor wore off. Or the many people accidentally buried alive because some cholera victims fell into a coma as deep as death. And I haven’t even begun to track down the ghosts of black plague fatalities, although there is a cholera graveyard in Sandusky, Ohio, said to be haunted by those buried alive. Cholera was a true horror, a quick and awful death that could not be outrun and for which there was no apparent cure. Did the terror induced by the black death distort perception so that ordinary occurences: food spoilage, tarnished metal, and miscarriage became imbued with some paranormal significance or were there genuinely mysterious events that deserved to be recognized as anomalous? And do such things still occur today whenever cholera appears? Re: your post on Cholera Curiosities: I was fascinated how similar those stories were to reports people made during the time of the (original) Black Death–ominous fogs, mysterious lights, strange animal behavior, and, of course, all manner of quack cures and superstitions aimed at driving off the disease. Some of your stories could come right out of the old chronicles. There were even reported sightings of strange humanoid-like figures (“Women in Black” prototypes!) At the time, of course, they were regarded as devils, come to spread the plague. Anyway, great job finding all these newspaper items! I had no idea cholera had its own fortean side. I actually think that most of the “Fortean” manifestations have a plausible explanation. Since cholera is a bacteria-caused disease, and since bacteria are also known to cause strange odors, unusual patterns of putrefaction, animal mortality, and strange animal behavior, it is not surprising to me that such things would occur during a cholera pandemic. Unusual weather patterns may certainly be related to an outbreak of cholera-type disease, since stagnant water in ditches contaminated by bacteria must be one of the main vectors for the disease, and obviously, unusual storms and wind conditions can affect how much water there is standing around in the landscape. The story about people in France being cured after they fell asleep intoxicated is interesting, because one thing diseases can do is to disrupt the immune system by not letting you get a full night’s sleep; a lot of healing takes place during the sleep cycle, and if you have severe diarrhea or a persistent cough, you are not getting a full night’s sleep and your immune system is hampered. I have personally found that just taking a dose of NyQuil has cured coughs or digestive problems, just by letting me get some sleep. (I’m not sure there is special healing magic in absinthe, although it’s a nice thought.) Then the observation that drinking alcohol without getting intoxicated leads inevitably to death, which also makes sense, since alcohol dehydrates the body (already dehydrated by diarrhea) and would exacerbate the symptoms. The brass prayer medals don’t seem likely to help, except as serving as a focus for prayer or for a simple placebo effect; and both prayer and the placebo effect have shown to have a positive statistical correlation with getting better, as compared to doing nothing at all; this is explained by the mind-body connection as expressed through breathing patterns, heart rate, etc. (you can certainly make yourself sicker by becoming anxious, so it follows that you can make yourself better by staying calm, and Mary Poppins-ishly, thinking happy thoughts). I was especially interested in the observation of the bread turning red during cholera epidemics due to a combination of fungi and bacteria present on the bread. This reminded me of an article I recently read online on TheAtlantic.com (“How a Guy from a Montana Trailer Park Overturned 150 Years of Biology”), which I think is something Undine linked to on her “Strange Company” blog. The article was about how scientists assumed the mystery of lichens was solved after they found a certain fungus living symbiotically with a bacterium; but it turns out that in order to make a lichen, you actually have to have TWO separate fungi (one of which had not been previously identified) in addition to the bacterium. This makes me wonder if there are other microorganisms that bloom in conjunction with cholera, and maybe it is the combination of two organisms that create the pandemic condition, or make the diseases more likely to kill an individual (the symptoms of cholera exposure range from mild and virtually invisible, to fatal within two hours; has anyone satisfactorily explained why the same bacterium has such a wide range of outcomes in different individuals? Are other microorganisms involved?) I’m not surprised by the peasants who tried swallowing petroleum products in the hope that it would kill whatever was eating out their guts; I’m not sure it would do any good (doubt it), but on the other hand, veterinary science for heartworm in the 1970s involved giving your dog increasingly large doses of arsenic until either the heartworm died, or the dog did. In short, I think there is a reprehensible tendency for people now to assume that our ancestors were foolish and incapable of perceiving patterns, and to assume that any patterns they described were purely imaginary or delusional. Just because you don’t understand a pattern that you are seeing, or if you give it a wrong explanation (religious, superstitious, whatever), that doesn’t mean that a pattern doesn’t exist. It’s just a matter of testing things scientifically, and looking for the cause & effect relationship. Thanks for another excellent post!